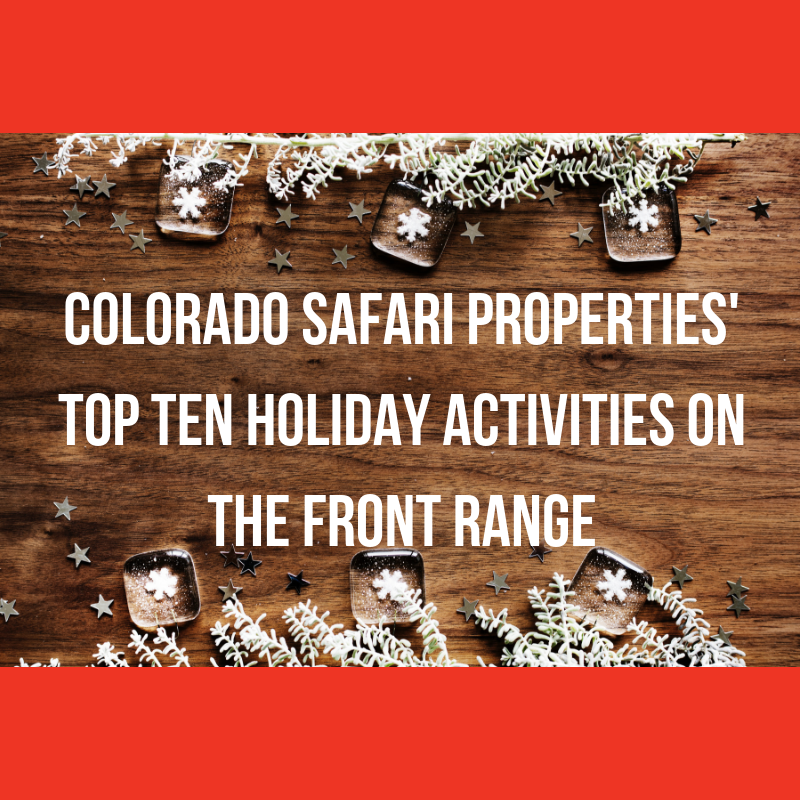 The following is a list of some Denver area holiday offerings. Most of these are annual events and can make great family traditions! Bring a little taste of Europe to your Christmas with a visit to this outdoor market across from the Clocktower on the 16th Street Mall. Stalls have food and gifts, and for a special treat, visit the warming tent to sample arguably the best winter beverage – Gluhwein, a hot spiced red wine. Adventure Golf in Westminster has three mini-golf courses completely decked out with Christmas lights and music throughout. The courses are open Friday, Saturdays, and Sunday evenings. Bundle up and enjoy! One lovely Denver tradition is a visit to Zoo Lights. After dark, the zoo comes alive with lighted sculptures and decorations. Make sure to get tickets ahead of time, as peak times sell out fast. The Denver Botanic Gardens provide another place to wander through a winter wonderland. Bringing in your own hot beverage (and add some Schnapps if needed to keep warm!) is allowed. A great way to get cozy inside during the holidays is to take a group for a holiday tea. It is a great opportunity to slip some Hygge and good conversation into the hectic season. There are lots of places to do this, but why not partner it with a tour of a historic property? The Molly Brown House and Castle Marne offer both. Want to find that perfect gift for the hipsters in your life? Visit the upscale outdoor flea market in Union Station on weekends to shop for local and handmade items. There are so many holiday concerts every season that we can’t list them all! However, check some of the links below if you are interested in attending live music events to get into the spirit! The Colorado Symphony or the Nutcracker are always winners, but have you heard of Tuba Christmas? How about something jazzy… Hazel Miller’s Christmas Show or David Benoit Christmas Tribute to Charlie Brown have you covered. Looking for something more unusual? Definitely go for the 12th Night, a Yule Concert and Viking Smorgasbord. Many area microbreweries have special tappings for holiday-themed beer – go out and sample! How about something different? Gone in 60 Minutes in Longmont has a Nightmare Before Christmas themed escape room that has a mix of puzzles meant for adults and kids so the whole family can enjoy the challenge. The holidays are a great time to take a day (or even a few hours) to give back to your community. Volunteers of America has many opportunities to volunteer for holiday events, to rake leaves or shovel snow for the elderly, or distribute holiday meals. The Colorado Gerontological Society creates and distributes holiday food baskets to low income seniors, and needs volunteers for wrapping presents, making cards, assembling baskets, and delivering them. There are also many toy drives in the area, giving you a chance to clean out the old before bringing in the new year!